With its soaring cathedral, charming burghers' houses, and elegant Louis XV buildings, Strasbourg has a distinctive old-world character. The quaint cobblestone streets and picturesque canals of the ancient quarters (on the Grande-Île) invite visitors to explore the city. Thanks to its advantageous location at the intersection of important traffic and commerce routes on the Rhine River, Strasbourg has prospered throughout its 2,000-year history. In the 13th century, it became the richest city in the Holy Roman Empire and a place where art and learning flourished. Today, Strasbourg is still a city of culture and boasts exceptional museums of fine arts, archaeology, and traditional Alsatian crafts. Considered one of the most beautiful monuments of Western architecture, the Cathedral of Notre-Dame looms over Strasbourg with its massive tower. This impressive Cathedral built out of red Vosges sandstone took several centuries to complete and displays a range of architectural styles-from 12th-century Romanesque to 15th-century Late Gothic. The exterior of the Cathedral functions as a lesson in biblical stories, complete with hundreds of figures. The 13th-century west front facade depicts scenes of the Christ's Passion, the work of Master Erwin and his successors. On the south side are famous allegorical sculptures of the Church and the Synagogue created by a German artist circa 1230. 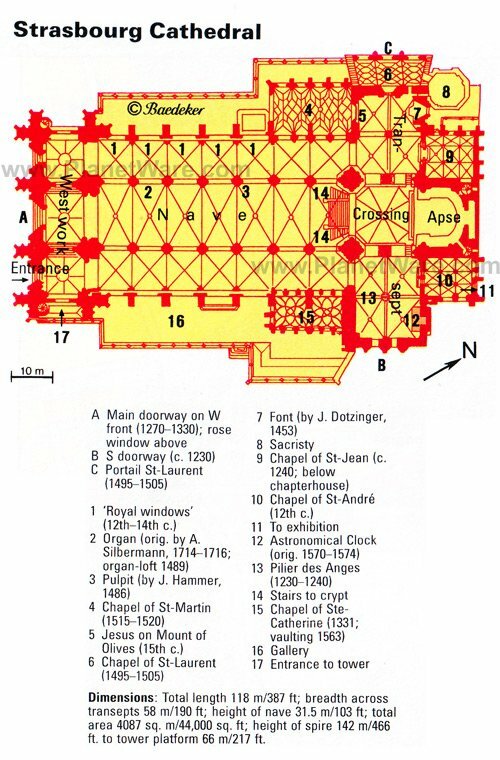 Two features added in the 15th century include the exquisite octagon of the north tower and the openwork spire. Until the 19th century, the 142-meter spire of the Strasbourg Cathedral was the highest in the Christian world. The Strasbourg Cathedral has exceptional medieval stained-glass windows that compare in magnificence to those at the Cathedral in Chartres. Among the most splendid are the stained-glass rose window in the west front and the Byzantine-style stained-glass windows in the choir. With colorful light filtered through these windows, the Cathedral's nave provides an inspiring space for spiritual contemplation. Another of the Cathedral's most exquisite works is the "Coronation of the Virgin" tapestry, which ranks among the highest achievements of religious art. The Cathedral has an enormous organ that features animated figures. In the south transept stands the horloge astronomique, a Renaissance astronomical clock. This masterpiece of timekeeping entertains visitors with a parade of the apostles every day at 12:30pm. After touring the inside of the Cathedral, visitors can ascend to the top of the tower for a magnificent view of the city, the Rhine plains, the Black Forest, and the Vosges Mountains. The most atmospheric section of Strasbourg's historic center, the Quartier des Tanneurs has a charming Alsatian character. This district is part of the Grande-Île (a large island surrounded by the River Ill) that is a UNESCO World Heritage Site. Also known as "La Petite France," the Quartier des Tanneurs delights tourists with its winding maze of canals and narrow, old streets lined by perfectly maintained half-timbered houses. During the 16th and 17th centuries, the neighborhood was home to the city's leather tanners and fishermen. One of the must-see attractions in this quarter is the Rue du Bain-aux-Plantes, where the emblematic Maison des Tanneurs (now an authentic Alsatian restaurant) is located. Strolling this cobblestone street offers a chance to admire the traditional Alsatian houses with their flower-bedecked balconies. Along the landscaped, tree-lined river banks of the Grande-Île, tourists and locals alike enjoy pleasant walks away from the urban hustle and bustle. To the southwest are the Ponts Couverts (Covered Bridges) that were formerly roofed. Four of the town's medieval defense towers also stand on these bridges. From the Grande Écluse (Covered Bridge that is the Vauban Dam), there is a panoramic view of the other Covered Bridges and the Strasbourg cityscape in the background. The Grande Écluse is open to the public during the day and illuminated at night. Near the Place de la Cathédrale is another of Strasbourg's most important sites, the Maison Kammerzell. This building (now a hotel with a renowned restaurant, located opposite the Tourist Office) is the finest old burgher's house in the city. Considered a gem of Alsatian architecture, the Kammerzell House features a stone-built ground floor, half-timbered upper floors, traditional leaded windows, and rich carved ornamentation. The building's ground floor with its carved stone arches served as a space where merchants sold their wares during the 15th century. Another interesting half-timbered house located in the area (at the Place de la Cathédrale and Rue Mercière) is the Pharmacie du Cerf. This building was constructed in 1567 on a site that has been a pharmacy since 1268. Nearby on the Rue des Juifs are the ruins of the ancient Roman fort, giving visitors a sense of the city's cultural heritage that dates back two millennia. The Church of Saint-Thomas is located on the site of an ancient church built in the early 6th century, dedicated to the Apostle Saint Thomas. After being destroyed by fire, the Church of Saint-Thomas was rebuilt in the 12th century. Strasbourg residents fondly call this church the "petite fille de la cathédrale" ("daughter of the cathedral"). The building exemplifies the Alsatian Gothic style of architecture with five naves of equal height. The choir houses a magnificent Baroque mausoleum of the Maréchal de Saxe, who was famous for his distinguished career in the military. During its 800-year-history, the Church of Saint-Thomas has been most renowned for the role it played during the Protestant Reformation of Alsace. The church was a center of the Lutheran movement in the region. The church has a clock, which for 400 years has struck the hours four minutes too soon-to make itself heard before the Cathedral clock strikes. The church is still used as a Protestant house of worship and offers religious services every Sunday morning as well as daily at noon. The Eglise Saint-Pierre-le-Jeune was founded in the 7th century as a Merovingian chapel. In the 11th century, the chapel was turned into a Romanesque church and that was transformed into a Gothic-style church during the 13th and 14th centuries. The church nave features beautiful vaulting with carved consoles depicting a lion to represent Saint Mark and a man slaying a dragon. The cloister of Saint-Pierre-le-Jeune dates back to the 11th century and is the only entirely preserved ancient cloister in Strasbourg. During the Reformation (beginning in 1524), the Eglise Saint-Pierre-le-Jeune became a Protestant house of worship and since then has been used for both Protestant and Catholic worship. The Church of Saint-Pierre-le-Jeune is still an important Protestant church in Strasbourg and offers traditional religious services, concerts, and celebrations. In 1349, the workers responsible for the maintenance of the cathedral established the Maison de l'Oeuvre Notre-Dame. The east wing of the building is the oldest part (and was renovated in the 16th century), and the west wing was built from 1579 to 1585. Today, the building houses the Musée de l'Oeuvre Notre-Dame, which has one of the finest collections of European medieval art. The collection represents seven centuries of art created in Strasbourg and the Upper Rhine region. On display are originals of sculpture from the cathedral as well as paintings and stained-glass windows. Visitors should be sure to see the Wissembourg "Tête de Christ" window, one of the oldest known stained-glass windows. The elegant 18th-century Palais des Rohan was the former residences of the Bishop-Princes from 1732 to 1742 (until the French Revolution). The rest of the immense building houses three exceptional museums. Located on the first floor of the Rohan Palace, the Musée des Beaux-Arts (Museum of Fine Arts) has an excellent collection of paintings by Italian, Spanish, Flemish, Dutch, and French masters from the Middle Ages to modern times. There are works by Botticelli, Courbet, Delacroix, Giotto, Goya, El Greco, Rubens, and Véronèse among others. The Musée des Arts Décoratifs (Museum of Decorative Arts) is located on the ground floor of the Rohan Palace, the former apartments of the Cardinals of Rohan. Visitors can see the sumptuous rooms of the bishop's apartment, including a library, print room, and chapel, as well as the collection of decorative arts. The collection includes ceramics, porcelain, paintings, time pieces, and goldsmith's art. Located in the Rohan Palace basement, the Archaeological Museum has one of the best collections of antiquities in France. The collection includes items from prehistory to the Middle Ages. Located in a patrician house built in 1620, the Alsatian Museum displays a collection of folk art, furniture, costumes, and domestic items. Visitors can view thousands of objects that offer an insight into rural Alsatian life in the 18th and 19th centuries. The museum also features rooms that represent the interior style of different regions of Alsace, including the agricultural plains and the Vosges Mountains. A tour of the museum gives visitors a feel for the charm of Alsatian homes. Near the Maison de l'Oeuvre Notre-Dame is the picturesque Place du Marché-aux-Cochons-de-Lait, one of the city's most charming squares. The square takes its name from the ancient market where suckling pigs (an Alsatian culinary specialty) were sold. Farther west is the Grande Boucherie, built in 16th century as a meat market, which now houses the Historical Museum. One of Strasbourg's most lively neighborhoods, the Quartier Krutenau combines Old World charm with trendy restaurants, fashionable shops, and art galleries. This district of canals and half-timbered homes was once where boatmen and fishermen lived, as indicated by the names of streets such as the Rue St-Nicolas-aux-Ondes and the Rue de la Tour des Pêcheurs. This quarter has a friendly village atmosphere and is a pleasant area to take a sightseeing stroll. Located in the Grande Boucherie (the city's former meat market building), the Historical Museum offers a comprehensive exhibit of paintings, graphic art, weapons, and everyday objects. The collections span the centuries from the Middle Ages to the French Revolution with a few rooms dedicated to the Napoleonic and modern eras. Visitors will learn about Strasbourg's politics, society, and economy throughout the ages. The museum dedicates exhibits to important political figures such as the famous General Jean-Baptiste Kléber. Also on display are the costumes and furniture of ordinary citizens, which offers insight into everyday life of Strasbourg in times past. One of the top museums in France, the Museum of Modern Art occupies a sleek, contemporary-style building on the banks of the River Ill, near the Petite France quarter. Designed with vast windows and high ceilings, the spacious 10,000-square-meter gallery space is bright and airy. The museum has an expansive collection of 19th- and 20th-century paintings, including works by Pablo Picasso, Claude Monet, Wassily Kandinsky, Hans Arp, Georges Braque, Paul Klee, Max Ernst, Auguste Rodin, Pierre-Auguste Renoir, and Edgar Degas. The museum also hosts noteworthy temporary exhibitions every year. To the southeast of the Palais de l'Europe is the beautiful Parc de l'Orangerie, the oldest park in Strasbourg. The Orangerie Park was created in the early 19th century for the Empress Joséphine. The garden's Pavillon Joséphine is now used for exhibitions and receptions. Perfect for romantic strolls and leisurely picnics, the park has an idyllic atmosphere complete with a lake and waterfall. The park's vintage car track, miniature farm, and small zoo (available free of charge) will delight children. The park also features a gourmet restaurant and a bowling alley. Strasbourg was chosen as the capital of the European Union because the city became a symbol of reconciliation after the Second World War. Designed by Henry Bernard (a French architect), the ultramodern Palais de l'Europe was built from 1972 to 1977 as a fortress-like structure of nine stories. Flanked by flags of all the European countries, the Palais de l'Europe is used as the principal building for the Parliamentary Assembly of the Council of Europe. The 751 members of the European Parliament meet in the building's Assembly Chamber, a vast tent-like space with a circular seating layout. The Palais de l'Europe is open to the public for visits; tours are available in English, French, and German. Besides taking a tour, another rewarding thing to do is attend a Parliamentary Assembly debate, held in the Assembly Chamber during a plenary session. One of the most enjoyable things to do in Strasbourg at Christmas is visit the famous Christmas Market, among the largest in Europe. This festive event has been a tradition since 1570 when it was called "Christkindelsmärik" ("Market of the baby Jesus"). Every year in time for the holidays, Strasbourg's houses, streets, and churches are decorated with Christmas lights, and a giant illuminated Christmas tree is placed in the center of the city at the Place Kléber. Throughout the city's historic center, around 300 stalls offer typical Christmas decorations, arts and crafts, and seasonal Alsatian delicacies such as gingerbread and foie gras. Some of the Christmas Market highlights include the markets at the artisanal stalls at the Place Broglie and Place de la Cathédrale, and the specialty food stalls at Place du Marché-aux-poissons at the terrace of the Palais Rohan. The Strasbourg Christmas Market begins at the end of November and ends on Christmas Eve (although some of the stalls stay open until the end of December). For the best experience, take a personalized Strasbourg Christmas Market Tour that includes visits to the best Christmas market stalls. 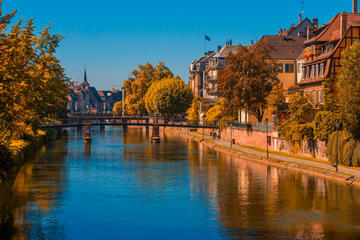 Strasbourg has several excellent music festivals held in the autumn months. Les Nuits Européennes is a festival in October that celebrates a wide range of European and world music. In October and November, the Jazzdor festival presents a superb program of live jazz music, providing a stage for talented French jazz performers, as well as European and international jazz artists. From mid-September through the beginning of October, the Festival Musica dazzles audiences with classical music, including spiritual choirs, operas, and symphony orchestras. One of the most whimsical events in Strasbourg, the Street Arts Festival in mid August brings lively animation to the streets and squares of Strasbourg's city center. With more than 75 free performances, the festival focuses on humor and merry amusement. Acrobats and clowns offer puppet shows, mini circus acts, juggling, magic tricks, and burlesque. Poets, musicians, and theater performers also provide lively entertainment designed to make audiences smile. Film buffs will appreciate the Strasbourg European Film Festival in September. This unique festival is dedicated to the genre of fantastic cinema, including animation, science-fiction, fantasy, and horror. The centerpiece of the Place Gutenberg is a 19th-century statue dedicated to the famous Strasbourg resident Gutenberg, who invented the printing press. On the southwest side of the square is the finest Renaissance building in Alsace, originally the Hôtel de Ville (Town Hall) and now occupied by the Chamber of Commerce (tourist information office). At the corner of the square near the Rue Mercière, there is a magnificent view of the front of the cathedral. Built in 1954, the Synagogue de la Paix was created to replace the historic synagogue that was destroyed by the Nazis in 1940. Although this monument lacks the splendor and elegance of the original neo-Romanesque synagogue, it stands as an important landmark to serve the city's Jewish community, which has had a presence in Strasbourg since the 12th century. Group visits to the Synagogue de la Paix may be arranged upon inquiry. Behind the Synagogue de la Paix, the expansive Parc du Contades is a peaceful space, with leafy pathways ideal for enjoying an afternoon stroll. During summertime, jazz, classical, pop/rock, and other types of musical concerts are held at the gazebo of the Villa Osterloff located at the back of Contades Park. Luxury Hotels: Preserving the building's historic character while adding luxurious modern comforts, Hotel Cour du Corbeau Strasbourg - MGallery Collection is near the cathedral and all the major sights. Also mixing historic architecture and decorative features with modern amenities (including a spa), Hotel Le Bouclier d'Or is in La Petite France and convenient to several restaurants. In La Petite France and within walking distance of several museums, Regent Petite France & Spa is a repurposed medieval mill. Mid-Range Hotels: In a 15th-century building at the edge of La Petite France, Best Western Hotel De L'Europe is a few blocks from the cathedral. The boutique Hotel Rohan offers contemporary rooms in the narrow pedestrian streets next to the cathedral, a five-minute walk from the boat tour dock. Hotel Cathedrale is right across from the cathedral, surrounded by restaurants and shopping. Front rooms have cathedral views. Budget Hotels: Also close to the cathedral, Suisse Hotel is a few steps from the three art and archaeology museums and the river cruise dock. A five-minute walk from the train station, Mercure Strasbourg Centre Petite France is near the bridge to the Grande-Île. Hotel Aux Trois Roses is only a two-minute walk to the cathedral, amid the restaurants and cafes of lively Krutenau. 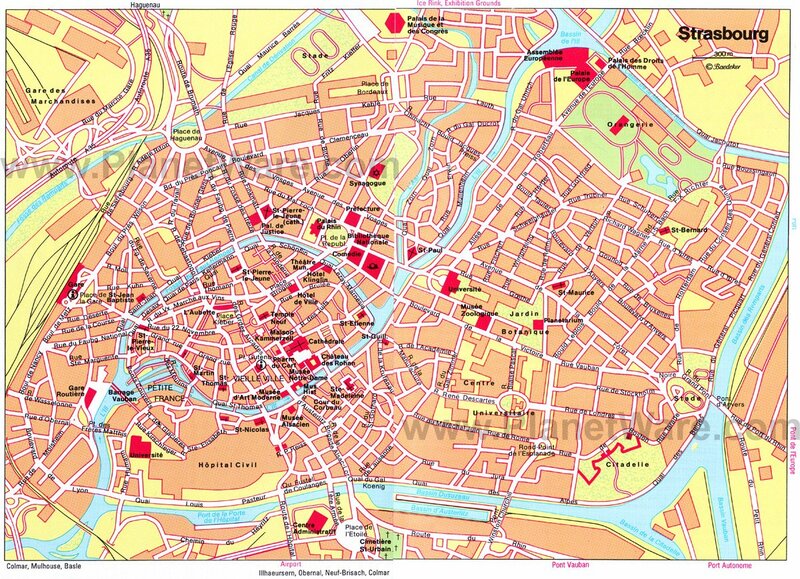 The entire city center (old town) of Strasbourg is inscribed on the UNESCO World Heritage List. This atmospheric medieval area, the Grande-Île, has several marvelous historic sites including the Notre-Dame Cathedral, the Palais des Rohan, and four remarkable ancient churches. Because of the city's rich history and traditions, taking a guided tour helps bring the city to life. Local guides are wonderful at sharing the historical context, architectural significance, and artistic value of the city's monuments; guides can also give tourists an insider's peak at the Christmas markets. Different types of guided tours are available to cater to various sightseeing preferences. Below are favorite biking, pedicab, and walking tours. Cycle around the City: Take a scenic bike ride through the historic center of Strasbourg, led by a knowledgeable local guide. You'll hear fascinating stories about the city and see key architectural landmarks. The 90-minute Strasbourg City Center Tour by Bike begins at the Place d'Austerlitz, continues through the Grande-Île, and finally crosses the Ill River to explore the German district. 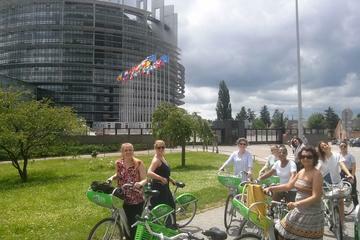 Take a Pedicab: To get an overview of the must-see sights in Strasbourg, a pedicab tour is a great option. On the Sightseeing Tour of Strasbourg by Pedicab, tourists (up to two passengers) sit back in a comfortable pedicab and enjoy one hour of sightseeing led by the driver. Two different scenic routes are available; both allow you to see top attractions, such as the cathedral, the Palais des Rohan, and the lovely Petite France quarter, as well as the Ill River and the Parc de l'Orangerie in the newer section of town. Enjoy a Walking Tour: The Private Strasbourg Walking Tour is a great way to fully appreciate the attractions of Strasbourg's UNESCO-listed Grande Ile. This two-hour guided walking tour takes you along cobbled streets to visit top sights like the Palais Rohan and the magnificent Cathedral of Notre Dame. Explore the enchanting La Petite France neighborhood and see picturesque canals, covered bridges, and half-timbered homes. Although Strasbourg is less than a two-hour TGV (fast-velocity) train ride from Paris, it feels entirely different because it's in the Alsace region. This area has a strong German influence, seen in the characteristic Alsatian architecture, culture, and cuisine. A wonderful Alsace vacation itinerary combines Strasbourg with the historic town of Colmar (only 30 minutes away by train) and the quaint villages and medieval towns of Alsace that are nestled in the rolling hills of the Northern Vosges Regional Natural Park. Tourists may also enjoy visiting nearby attractions in Germany: the Black Forest lies less than a one-hour drive away from the Alsace region, and the city of Stuttgart is a two-hour drive from Strasbourg.